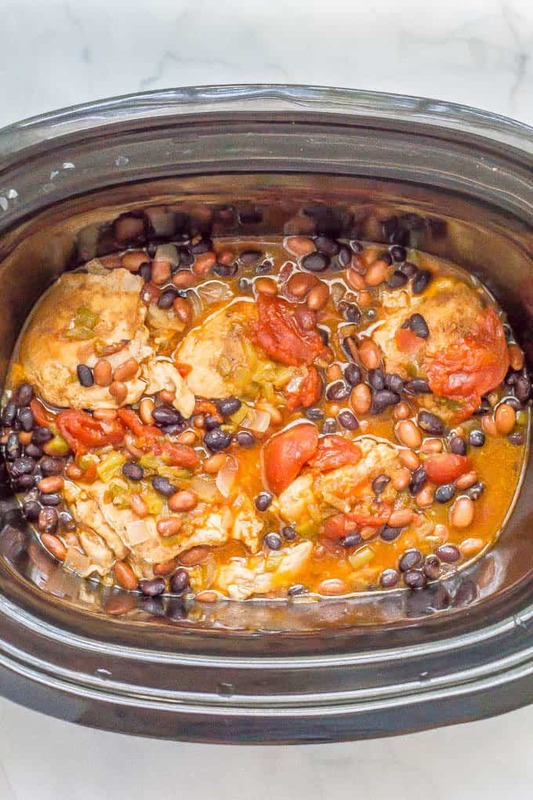 Slow cooker Mexican chicken stew is easy to prep and smells amazing as it cooks! It’s perfect for a comforting, flavorful family dinner! We are solidly into the fall season now and even though we’ve had some warm days here in N.C., I’m loving all the fall produce and all the fall soups! I’ve made my cheesy chicken and broccoli chowder and my 20-minute chicken and tortellini soup with kale and next up on the list is my vegetarian pumpkin chili. I also just shared with you my roasted butternut squash apple soup, which is so creamy and delicious! This slow cooker Mexican chicken stew is super easy to prepare, using pantry staples you probably keep on hand! And oh my goodness does this smell amazing! I love walking back into the house as it cooks and having it just greet me in the face. Even from upstairs, I’ll get wafts of its aroma and my stomach starts to growl! 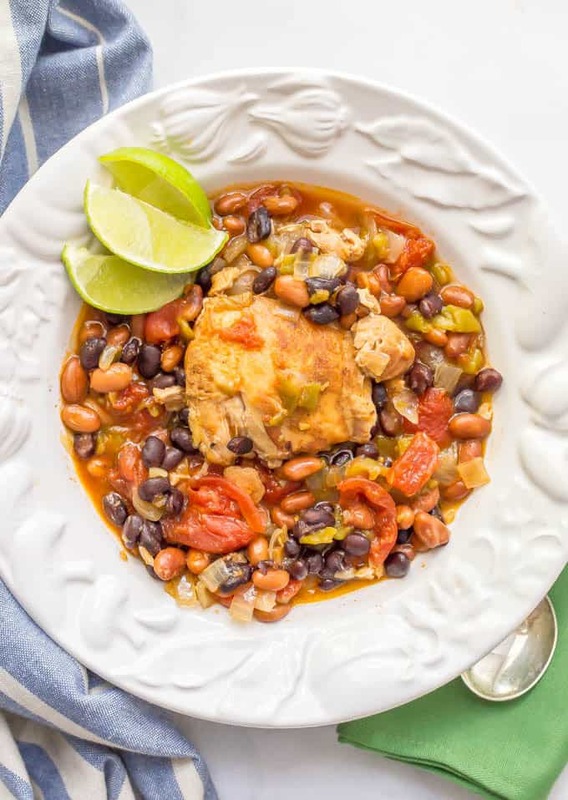 This stew has melt-in-your-mouth tender seasoned chicken thighs, plenty of rich tomatoes and a mix of beans that really add some heartiness. And, of course my favorite part, ALL kinds of topping options! I made a few minor changes but it’s pretty close to the original. I use pinto and black beans but the original recipe calls for pinto and kidney beans. Use whichever you prefer. You could add 1 cup of fresh or frozen corn (or some canned regular or Mexicorn) to this stew as well. I’d add it when you add the beans. You could also add a roasted poblano pepper to this stew – that would be delicious! And if you like it spicy, feel free to add a chopped jalapeño pepper or some red pepper flakes. You could also serve it with hot sauce, which is what I do so it’s not spicy for the kids. Want this to be more of a soup than a stew? Add 1 to 2 cups of low-sodium chicken broth to thin it out a bit. 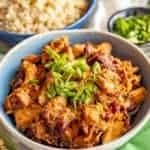 As for the toppings, here are some ideas: chopped fresh cilantro, plain Greek yogurt (or sour cream), sliced avocado, shredded cheddar or Monterey Jack cheese, hot sauce, and anything else you might want to have with this stew! 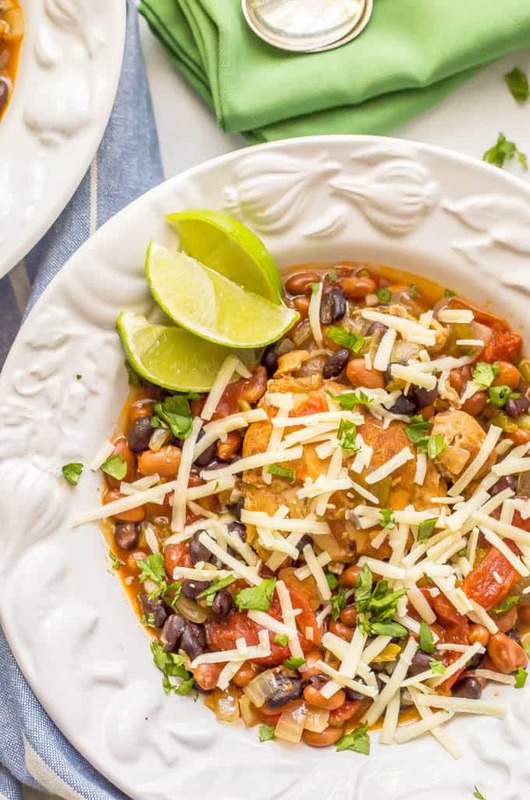 As is, this slow cooker Mexican chicken stew is a lovely low-carb, gluten-free dinner that will totally fill you up. You could also try serving this over steamed brown rice for a really hearty stew. 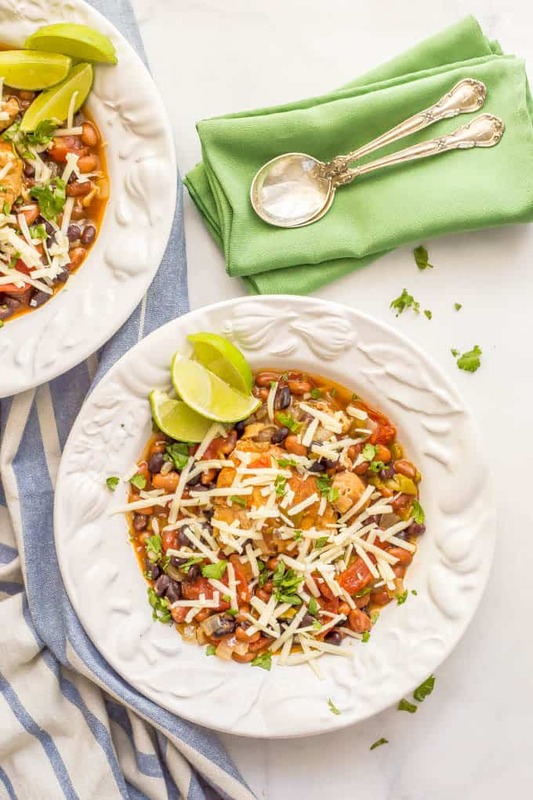 I hope you give this a try on a chilly night when you just want to cozy up to a bowl of goodness, without having to slave over it in the kitchen! 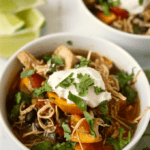 Slow cooker Mexican chicken stew is easy to prep and smells amazing as it cooks! Chopped fresh cilantro, plain Greek yogurt (or sour cream), sliced avocado, shredded cheddar or Monterey Jack cheese, hot sauce, etc. Mix together the cumin, salt and pepper in a small bowl. Season the chicken thighs on both sides with the spice mixture. Heat a large sauté pan over medium high heat. Spray with cooking spray (or add a teaspoon of extra-virgin olive oil) and sear the chicken thighs until well browned on both sides, about 6-8 minutes. Add the can of tomatoes to the sauté pan to deglaze it and use a spoon to scrape up any charred bits that are stuck on the bottom. Add the tomatoes, onion and green chilies to the slow cooker. Uncover, add the beans, then cover and cook for another 1 hour on high (or another 2 hours on low). 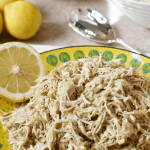 Spoon chicken stew into bowls and serve with desired toppings. Enjoy! You can sub kidney beans for the black beans if you prefer. You could also add some corn (about 1 cup, fresh or frozen), when you add the beans. A roasted poblano pepper would be a great addition as well. If you like it spicy, you can add a chopped jalapeño pepper or some red pepper flakes to the stew. You could also serve it with hot sauce, which is what I do so it’s not spicy for the kids. Adapted from Cooking Light Slow Cooker cookbook. Agreed! I love having dinner ready and waiting for me! Can this be made not using slow cooker? Hi Mona! I haven’t tried but I’m sure you could cook this in a Dutch oven on the stove. Maybe an hour to an hour and a half for the cooking time? You’d need to use a thermometer and make sure the chicken thighs get cooked through. Would love to hear if you try it!